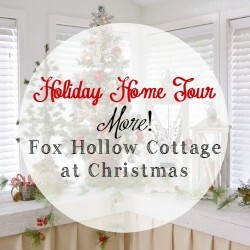 Balsam Hill 12 Bloggers Christmas Tree Reveal - Fox Hollow Cottage Balsam Hill 12 Bloggers Christmas Tree Reveal Plus Giveaway - Fox Hollow Cottage Holiday Tree Decorating in Classic Red with Eclectic Elements. 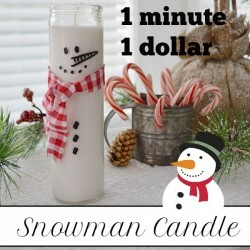 Today’s post is sponsored by Balsam Hill. If you are reading this on publishing day, Happy Thanksgiving!! 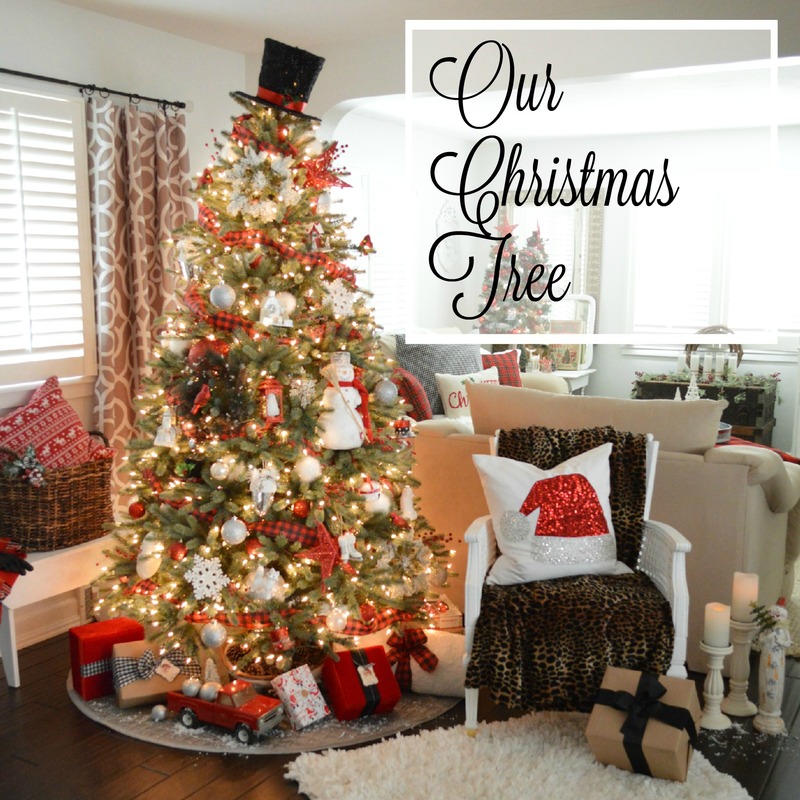 I’m so thankful that you stopped in today to see the very first full size tree I’ve ever decorated & shared here on the blog. If you would take a moment to go visit my team mate Amy who is also revealing her holiday tree today, that would be marvelous. We just happened to have our dates hit on Thanksgiving day, and we sure appreciate you joining us!! You can find her at The Idea Room [here]. Okay, now…. I’ve been waiting and waiting to show you!! 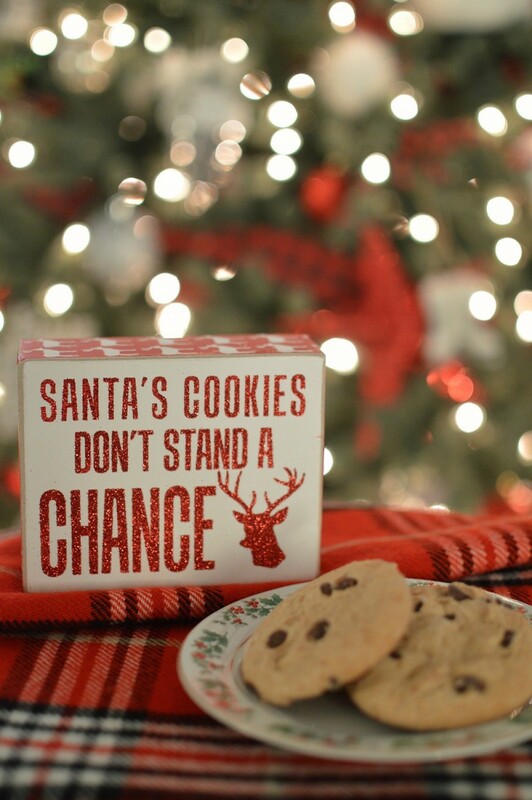 Before we go full Christmas tree crazy… I want to say that I hope the day finds you surrounded by friends, family and lots of yummy food. 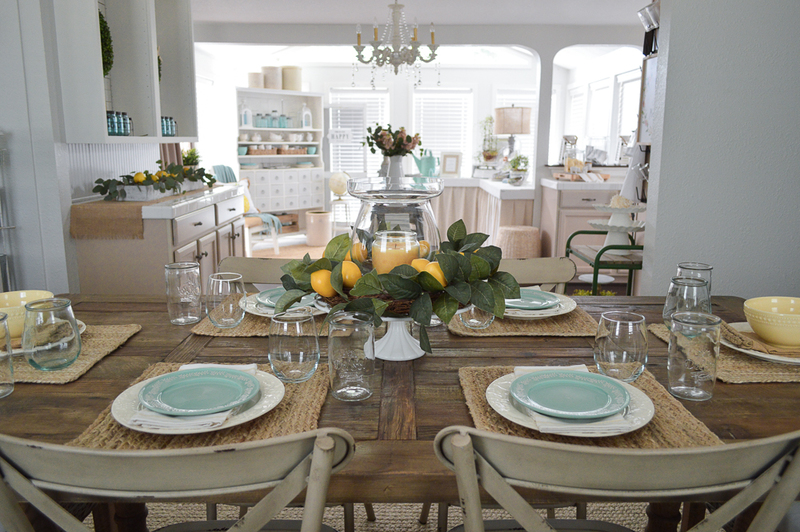 We will be spending the day with family, enjoying Turkey, all the trimmings… and of course, a variety of desserts! We are big game players too, so I suspect some good natured competition will be happening as well. 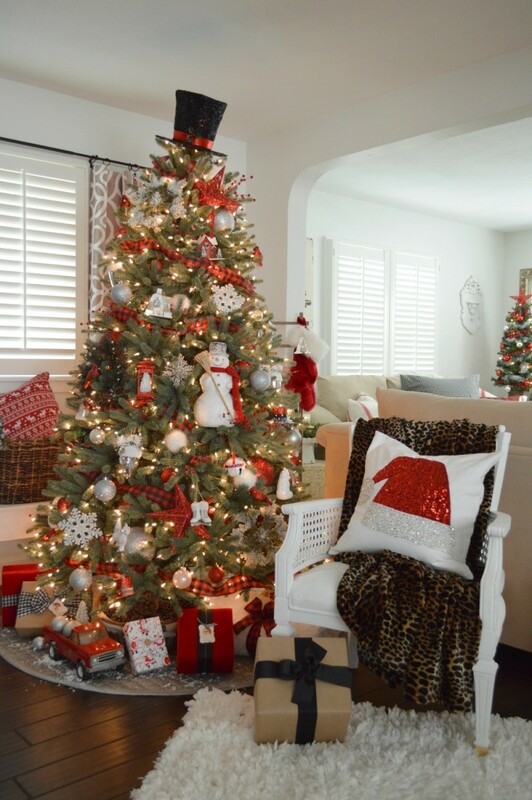 Now come see our tree…. 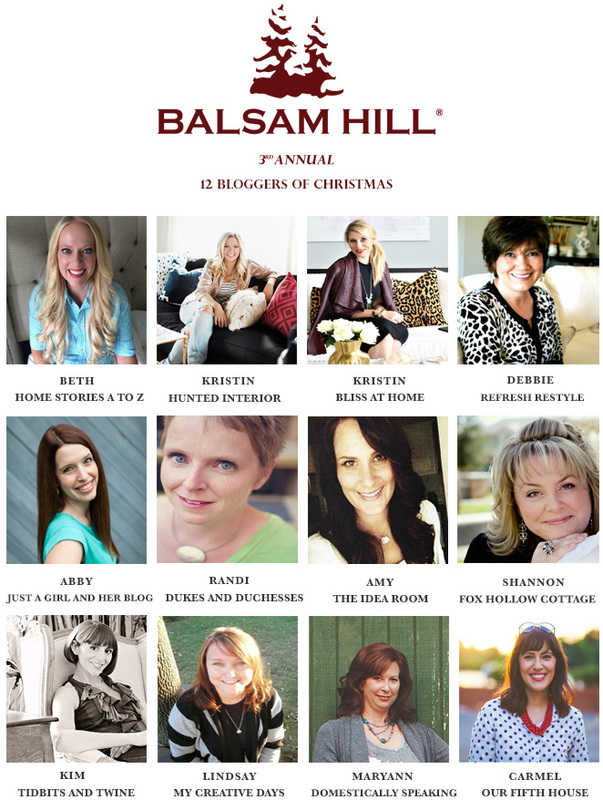 When my friends at Balsam Hill invited me to participate in the 12 Bloggers of Christmas, the timing could not have been better! With all the resent changes I’ve been making with dining room table eliminations, we’re able to have a full sized tree again for the first time in many years. And there was no way I would risk using a live tree that requires water on my wood floors. So faux is the way to go. And lucky me, I got easy too! 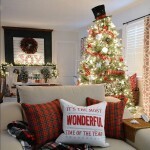 Balsam Hill provided me with the amazing Blue Spruce Flip Tree [here]. Naturally, I placed it right in the center of everything! The rest of the house just kind of orbits around it. It’s definitely commanding attention and you can see it from all the rooms on the main floor! If you follow me on social media, you might remember the “can’t wait to show you sneak peek” when I shared the naked tree, wearing only a top hat. Well, that is just what I started with. It was definitely my inspiration to get my tree started. I’m not a traditional tree topper kind of girl, so this was a lucky find!! 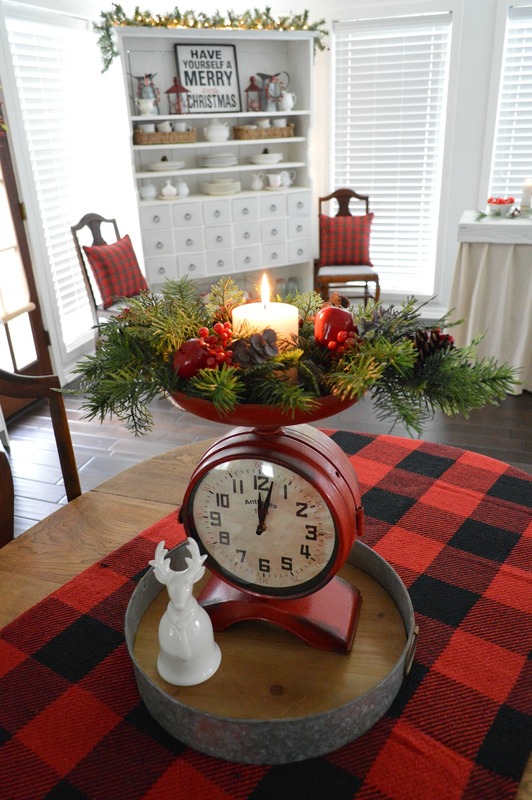 I have a lot Christmas decor in the red family, so when I found the red & black buffalo plaid ribbon, I knew it would be a great fit. It was really reasonable too. 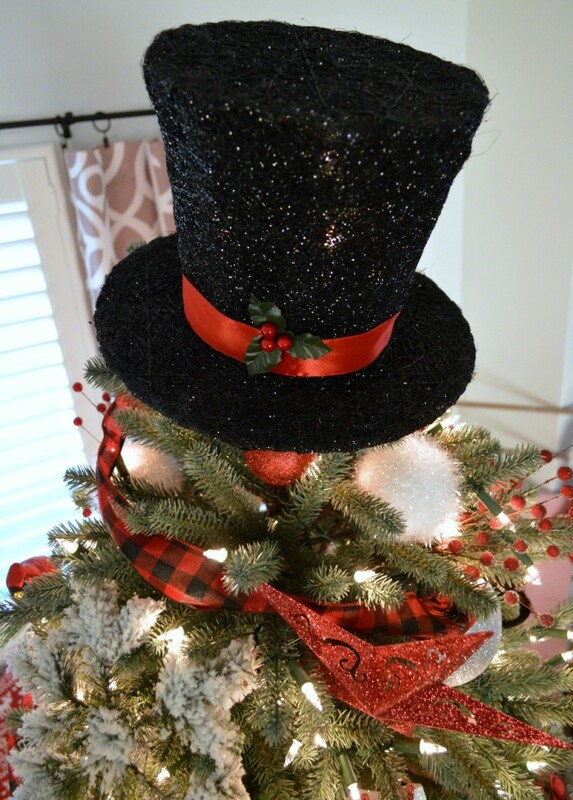 After the top hat, the ribbon was put on the tree next. Things really started taking shape when I dug into my ornaments. This tree is so full & lush. I love it when branches can support my variety of ornaments. 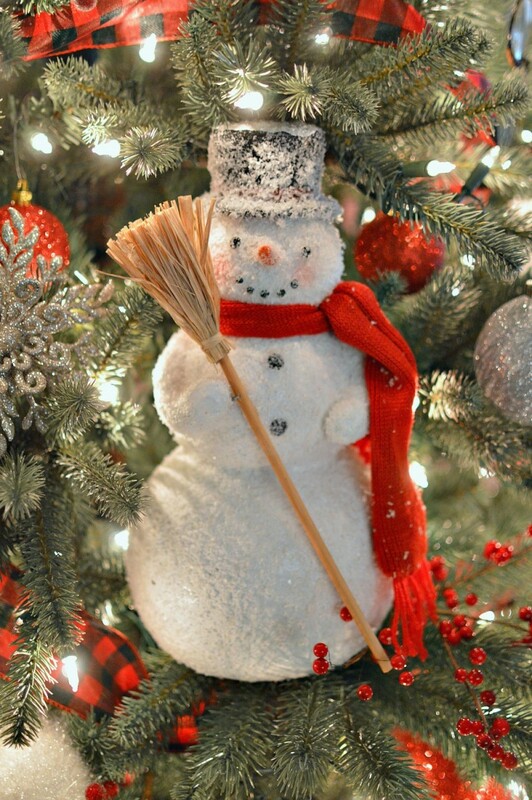 Heck, this tree even holds big, fat, full size home decor, like my Frosty The Snowman figurine!! Of course, he can only ever live in a Christmas tree now… because I may have dropped him while holding him up to see if I liked him there. His backside is a little bruised. Oops. 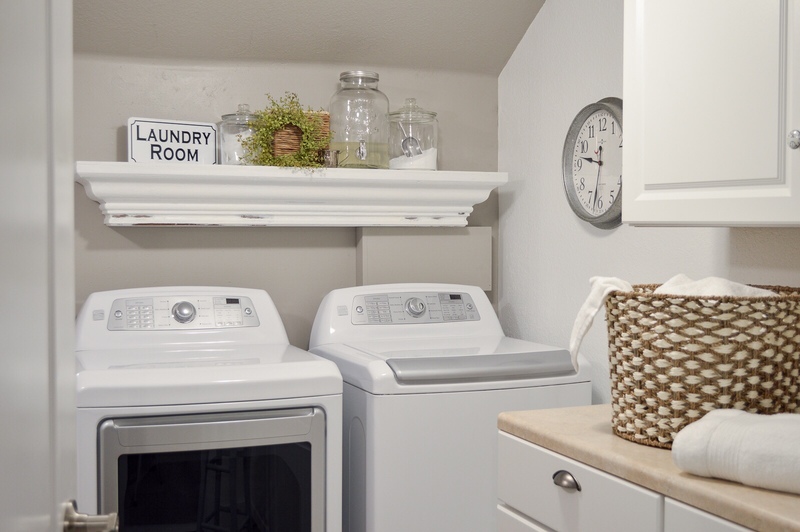 Tucked in the corner behind the tree is a vintage drying rack. You can just see it peeking out from this angle. 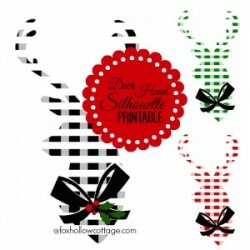 I’ve got Christmas linens and a few stockings hanging on it. The few gifts I’ve got wrapped are resting on the silver tree skirt [here] and it couldn’t have went with my color scheme any better. It’s such a pretty fabric and it’s the perfect balance of casual with the quilting and elegance with the subtle, matte metallic finish. I usually love to add fresh sprigs of greenery to my holiday gifts, but it was pouring rain when I was wrapping (and taking photos!) so I skipped it for now. Hope you’ll forgive me. See how dark it is? It was right in the middle of the day. A big storm rolled in, the sky opened up and it was about 42 degrees out. Burr. Y’all are lucky I didn’t snuggle up on that rug and take me a nap! hahaha. It was snuggle-up weather for sure. Almost forgot to tell you, in addition to the tree being fast & easy, it’s also pre-lit. This tree is so stuffed with lights, it’s absolutely luminous. And it came luminous. With no effort from me. Oh wait, I did plug it in. And I pay the electric bill. So go me!! I tell you, I’m completely tree-spoiled now. If there is such a thing, I am for sure it. In typical me fashion. I kind of mixed & matched what I liked and stuffed it all together. I’m so style challenged. 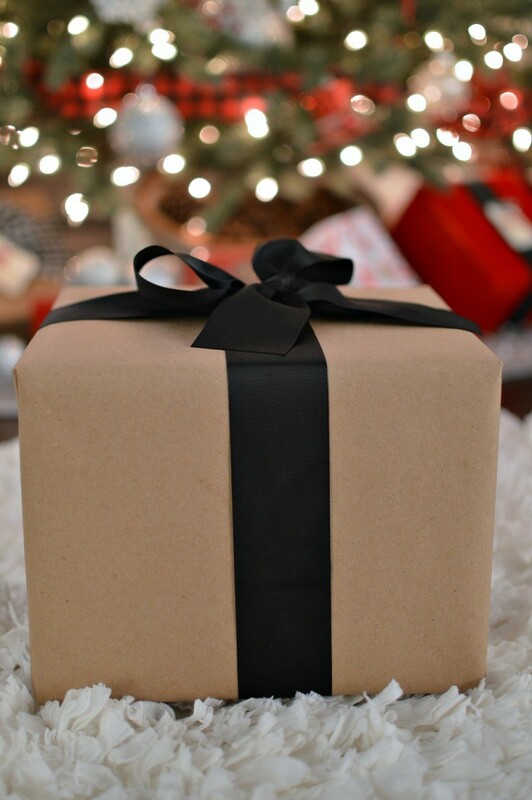 Old junky pick up trucks… simple, brown paper wrapped packages. 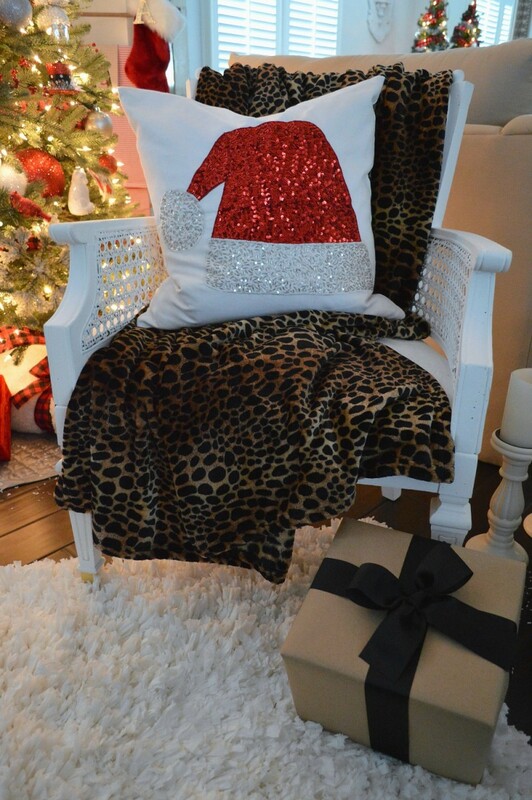 Paired with sparkly-glam sequined pillows & luxe leopard throws… I don’t think I could give my tree a theme name if I had too. If I did, it would be a mouthful. 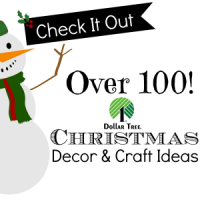 Maybe… Frosty, Foxy, Buffalo Check, Snowflake, Woodland, Vintage, Snowman Adventure? hahaha. Yes, it’s catchy. And really rolls off the tongue. 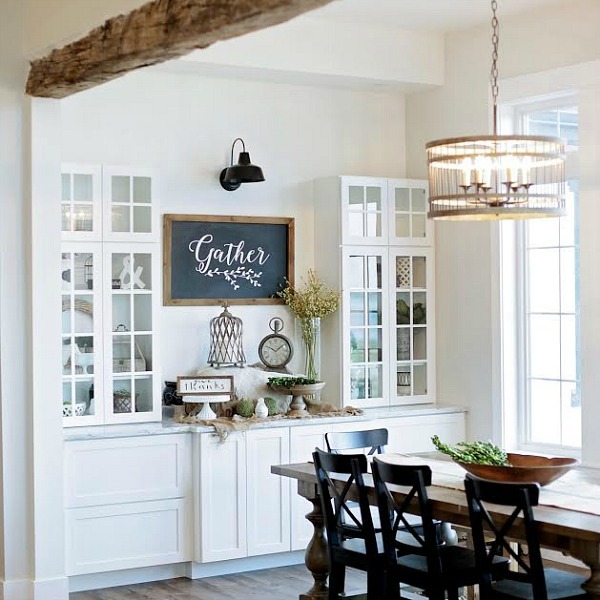 Giveaway: Don’t forget to visit Balsam Hill to enter for a chance to win one of the giveaways that include: 10 $100 gift cards, 1 $300 gift card, and 1 $750 gift card specifically toward a Balsam Hill tree of winner’s choice (more than $2,000 in total). 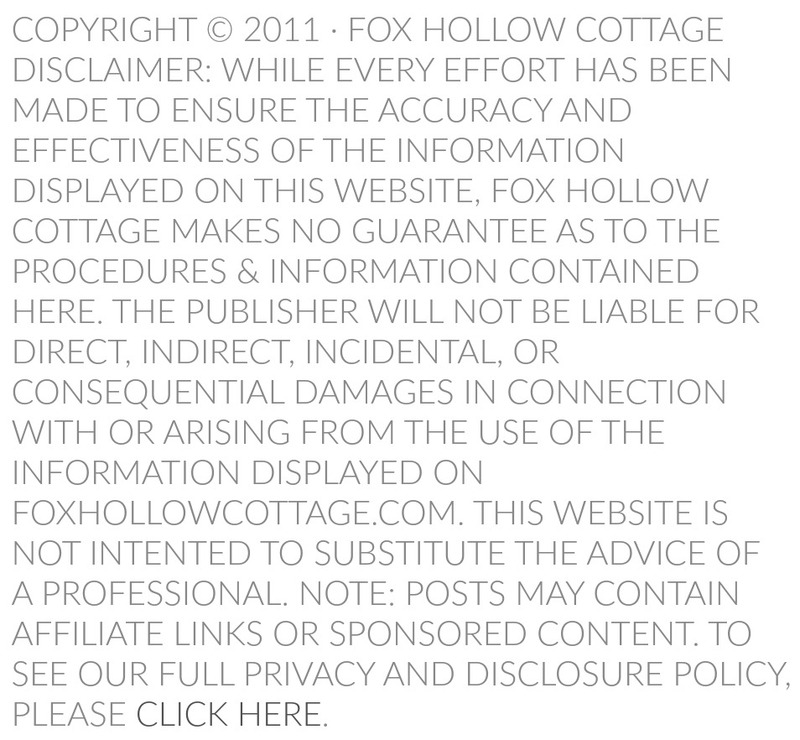 Discount Code: And here is a special discount code just for Fox Hollow Cottage readers and friends: 12BFOXHOK2015 — ( Click [here] to redeem it for $25 off a purchase of $200 or more. Expires 1/31/2016) Code is one-time use, per person and can not be combined with any other coupons or sales. 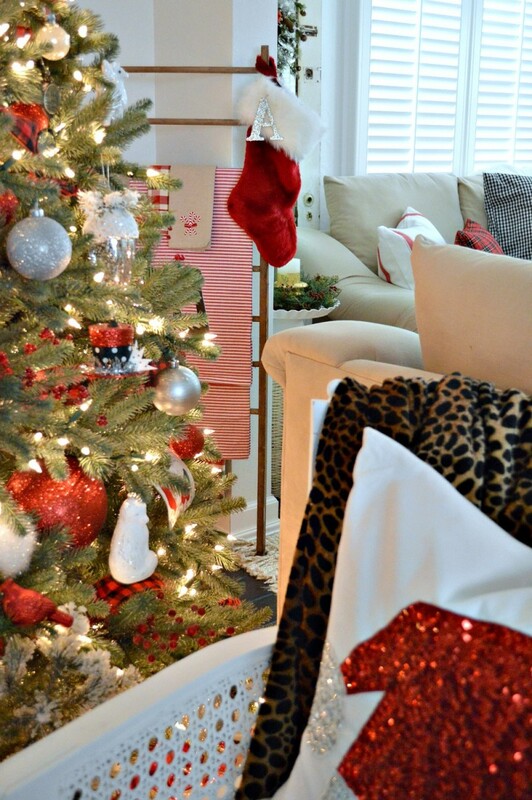 Thanks again to Balsam Hill for providing me with the perfect tree, for the girl who loves fast & easy!! Thank you again so much for hanging out with me for a few. I always appreciate the company. 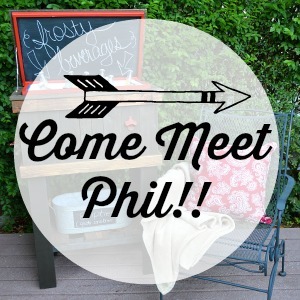 If you want to visit more, you can always find me on Facebook & Instagram. 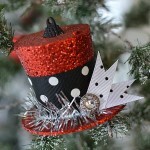 Shannon – Your tree is just so beautiful – fantastic plaid ribbon I love that top hat! 😉 It’s been so much fun being on tour with you this week. 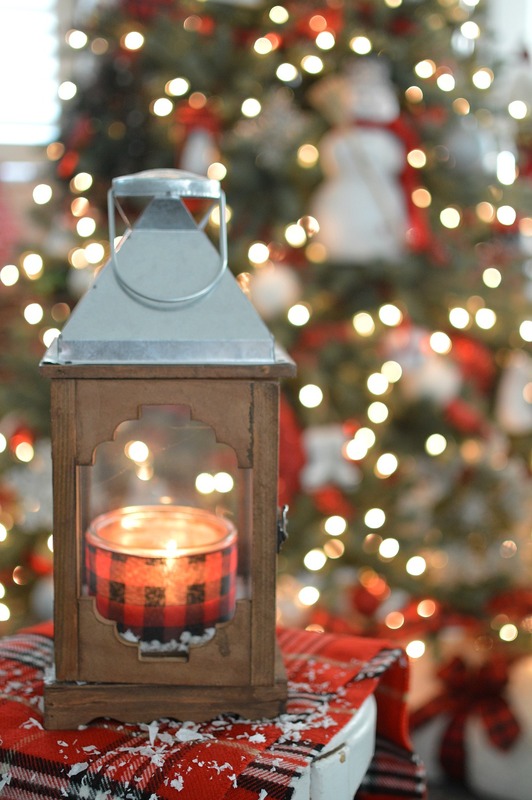 Enjoy the weekend and have a wonderful holiday season! 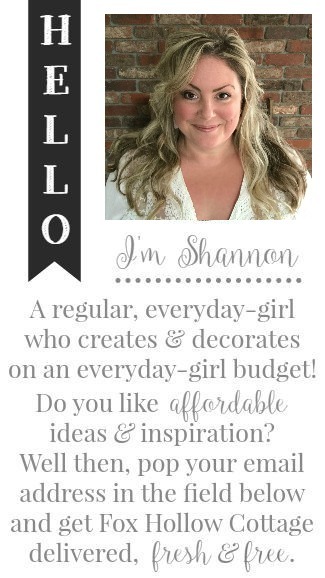 This is beautiful, Shannon! And that topper totally makes it– how fun! 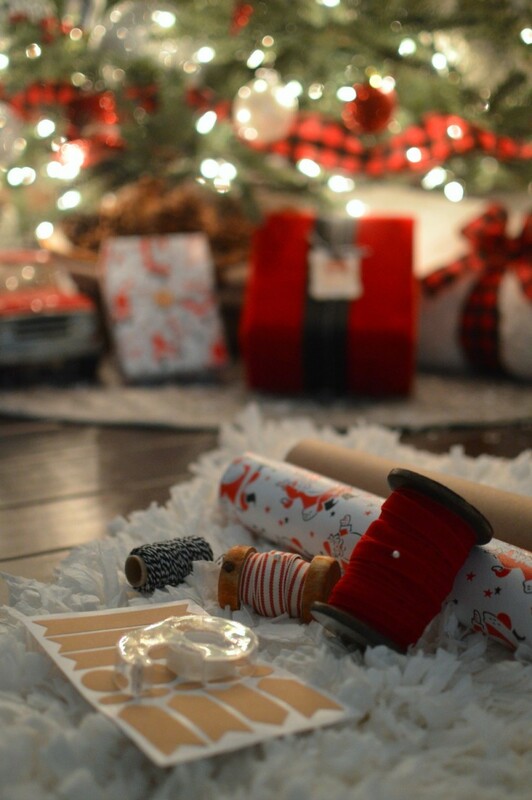 I love the buffalo check ribbon, too. It was great being “on tour” with you this week! Hope you’re having a wonderful weekend! Love your tree! 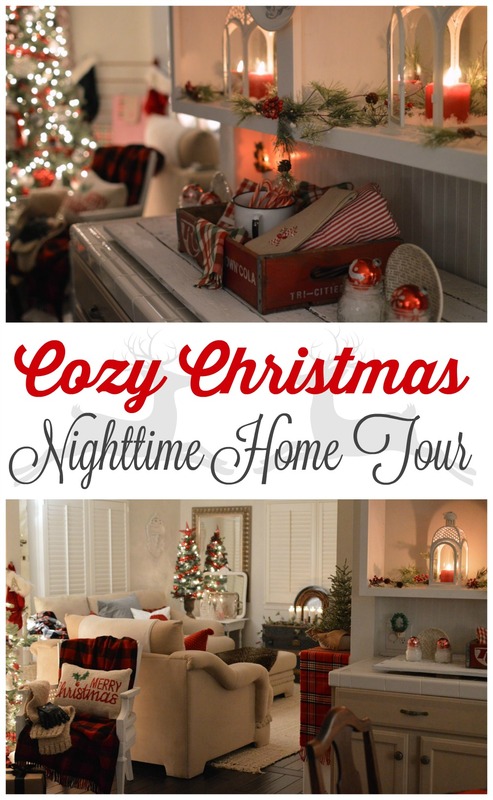 Your home is so cozy and inviting. 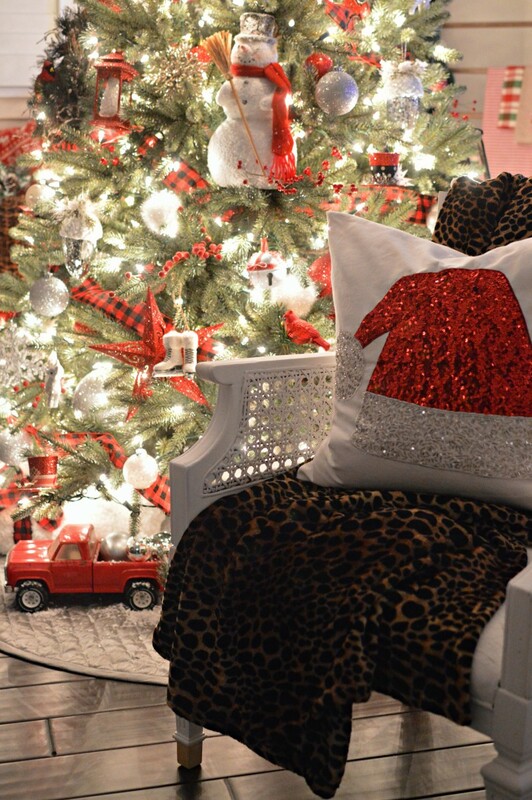 I would love to curl up with a hot chocolate and stare at the tree for hours! 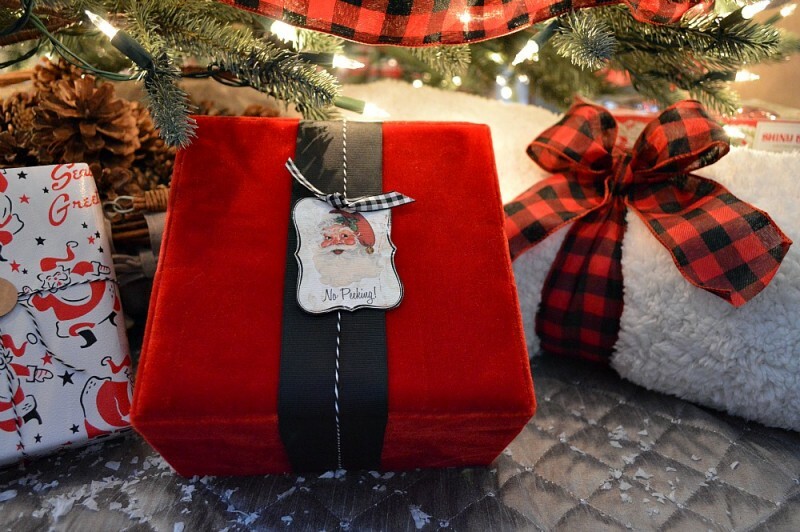 Love the buffalo plaid ribbon and the rustic wrapping. You are sooooo talented! Shannon, I love your tree. It is so cute with the touches of red and you know I’m a sucker for checks. I wish I had said yes to this tour when I was asked, but I just couldn’t do it when I was hosting Thanksgiving this year. 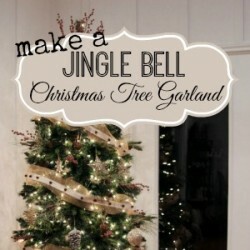 Now, I wish I had because my tree would already be done and they have such beautiful ones. What a beautiful tree, love it!! Shannon, Your Christmas tree is gorgeous! Love every detail! How beautiful Shannon! 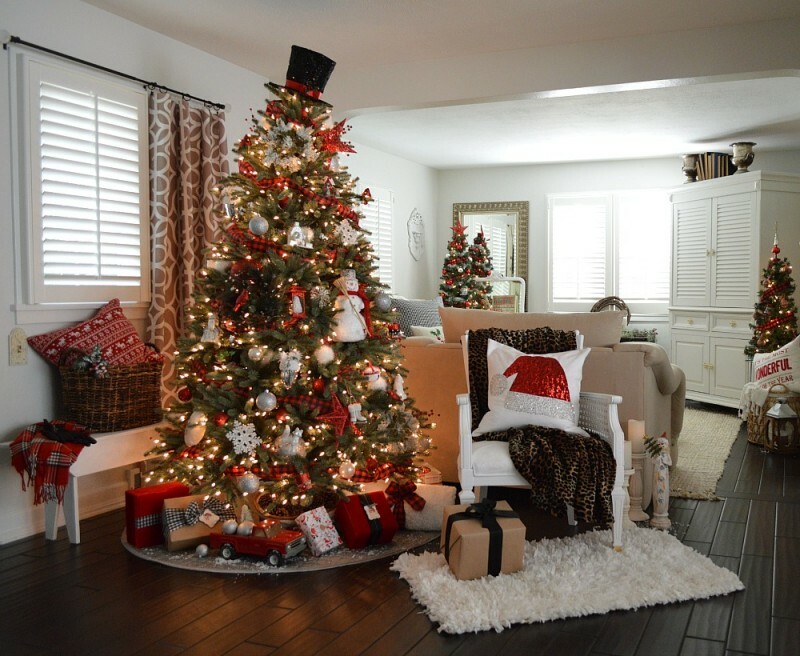 I am loving classic Christmas colours this year…the reds, whites and silver on your gorgeous tree – love it all! okay…got to the right area to reply….LOL…didn’t want to log into Facebook…. 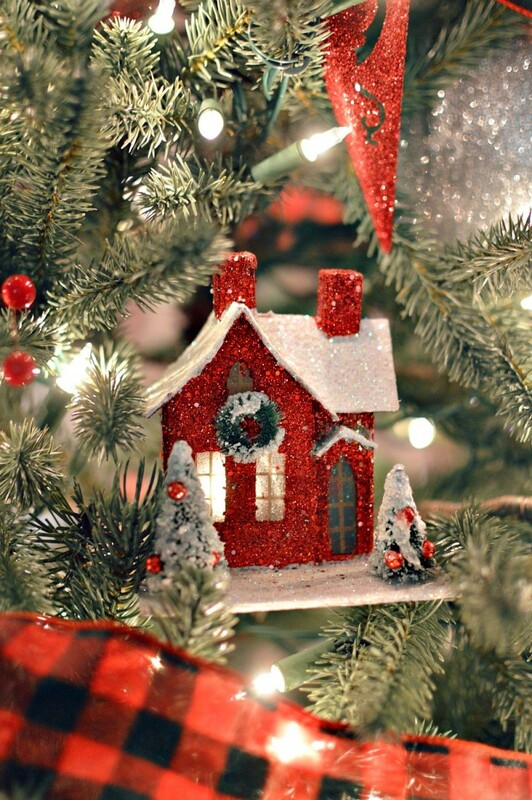 very pretty….and that red glitter house….LOVE IT…. Shannon, your tree is stunning! 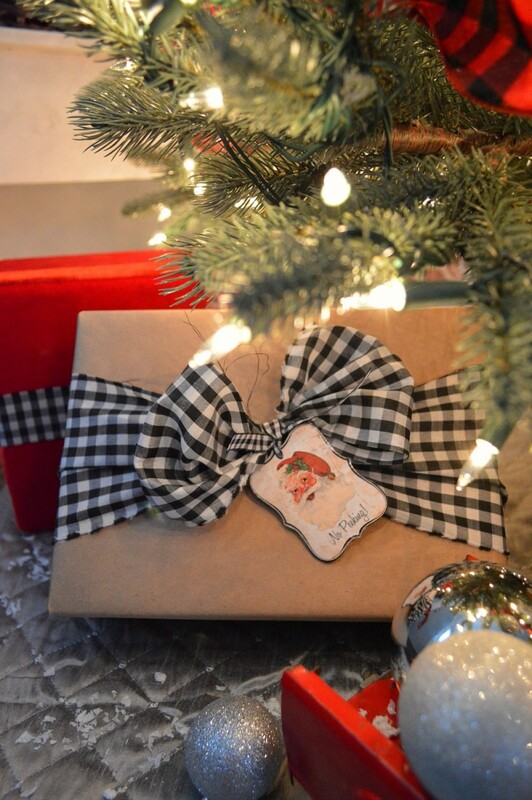 I love the reds and the gingham in it and on your packages. 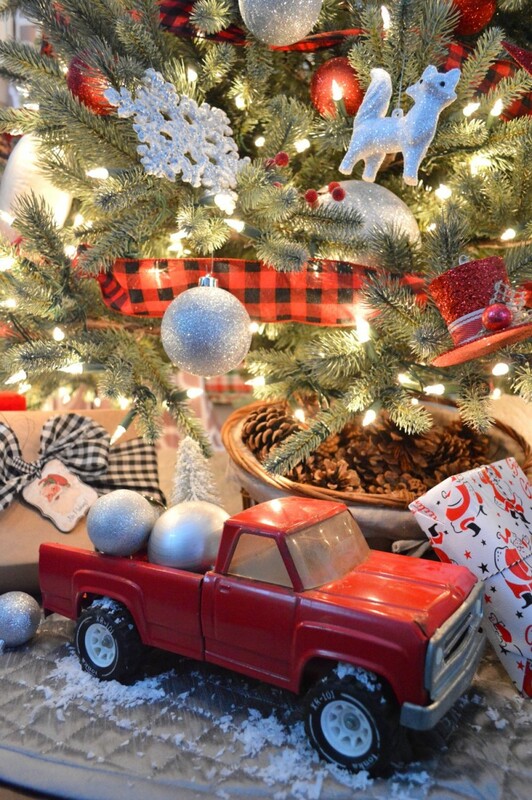 That little red truck is ADORABLE!!!! That was such a lucky find. 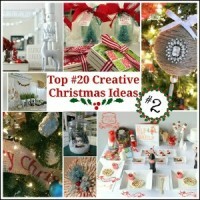 Balsam Hill 12 Bloggers Christmas Tree Reveal - A pretty Blue Spruce gets a Top Hat as a topper and our Frosty The Snowman tree is born!